Okay so by now you have likely already committed to losing weight and want to make sure you have a way to keep yourself accountable and see if this whole “weight loss” thing is really working for you. Maybe you also need someone or a way to help keep you accountable to your goals. Here, I have four tips for you that will help to keep you accountable. Listen above to Dr. Jamie McManus as she discusses four tried and true tracking measures for weight loss tracking success! 1. Step on the scale, but not too often! Get your waist and hip measurements each week. You can also track your dress or pant size too and you will see the changes as you lose body mass and tone up. Tracking inches is more important than tracking pounds! As you can see in the illustration to the right this same person weighs the same but the image on the left has more body fat and lower muscle tone and the person on the right has maintained her muscle tone and shed unhealthy excess fat. 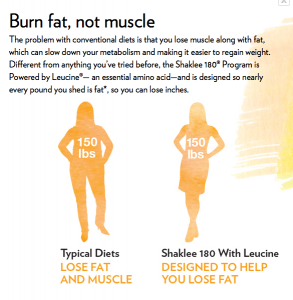 Shaklee’s 180 Turn Around Program contains leucine, an essential amino acid, to help you shed the fat and not the muscle. One way to do this is with bioelectrical impedance, many scales have this built in. Bioelectrical impedance is a fancy was of talking about a tool used to test your bodies composition and see what percentage of your body is fat. You can also ask your doctor or gym to help you with the use of skin calipers. You should try to use a combination of tools that will work for you to help keep you on target. One easy way to do this is to work with a Shaklee 180 coach like myself or find a buddy who wants to lose weight with you. For a great and easy mobile tracking tool, Shaklee 180 has a free app to help you keep track of your mood, exercise, food and progress. Keep a combination of these tools in your pocket to help you stay motivated and see the progress! To start your weight loss journey with Shaklee 180, click here to get started.